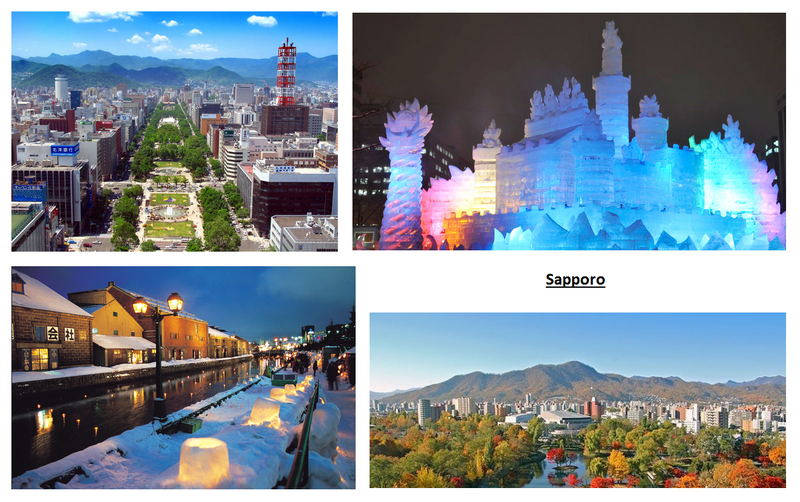 Sapporo is the capital of the prefecture of Hokkaido – Hokkaido being also the name of the northermost Japanese island. It has almost 2 millions of inhabitant, thus being the 4th Japanese city. This city is famous for its “snow festival” which attracts each year about 2 millions of visitors from all over the world and for its brewery. The climate is temperate, with wide discrepancies. Summers are hot, though not humid as it is in the rest of Japan. Winters are cold and very snowy. A lot of Japanese people enjoy spending summer vacation in Hokkaido which is relatively cool compared to other places. In winter, it is also a prized destination for winter sport lovers. In Sapporo, there are JR (train) lines, subway line and streetcars. New Chitose airport is an international airport, serving other Asian countries. There are two national universities in Sapporo: Hokkaido University and Hokkaido University of Education, two public universities: Sapporo Medical University and Sapporo City University, as well as many private ones.